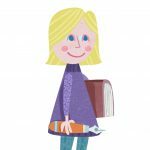 My job is to work with scientists, astronauts and technology experts to find ways to write about their work for a young audience. I do this through story telling – finding a way to weave an adventure story around their research or their experiences. It’s very fun and super cool – only sometimes it gets difficult to include as much information as I would like into a story line! I don’t really have typical days – I do lots of events, festivals and schools visits as well as trips abroad. But if I’m at home, I try to write for as many hours as possible in the day! I’m great at distracting myself from work and have to stop myself from finding other ‘urgent’ tasks to get on with! But I love writing so once I’m at the computer, hours can pass without me really noticing. 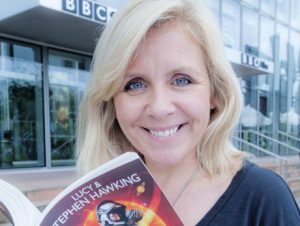 I got into space science when I started work on the first adventure novel for young readers that I wrote with my father, Stephen Hawking. Because I grew up in a very pro-science family, I already had lots of opportunity to engage with scientific topics. But writing about space made it come alive for me and I hope that Space Diary will do the same. I was very interested in natural history as a child and the environment. I have always loved reading – I was a book worm from a very early age. I also took part in loads of plays and musicals – I really enjoyed performing and still love going to the theatre to see shows. If I wasn’t an author, I would be a journalist which was my first profession. In my fantasy world, if I wasn’t an author I would be an ice dancer! I was at the Science Museum with the rest of Space Diary team to watch the launch which was super exciting! There were hundreds of fans and the cheering when his space ship took nearly raised the root! It was a great day. I would tell my 8 year old self something an astronaut said to me! He told me that the best advice is to work hard at school and do well in a range of subjects. The space industry needs people with lots of different skills, from maths to communication. He also told me that the best food to eat for breakfast before travelling into space is a banana! Lucy is the author of the Principia Mission Space Diary. 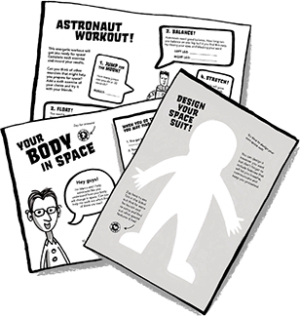 Log in or sign up to the Principia Mission Space Diary website to download your own copy of the Space Diary along with teaching notes and resources.